Happy summer solstice! Summer solstice officially occurs at 2:07 am Alaska Time. Where I live in McCarthy the sun will rise at 3:49 am and set at 11:17 pm for a total of 19 hours and 28 minutes of daylight. That contrasts with the winter solstice, where we have 5 hours and 22 minutes of daylight. Daylight gives us energy and makes us happy so it’s a reason to celebrate. You can use this daylight calculator to see how much daylight there is on a certain day of the year in your location. This year I decided to participate in the 100 Days Project, a free, global project, hosted online where people do one creative act every day for 100 days. 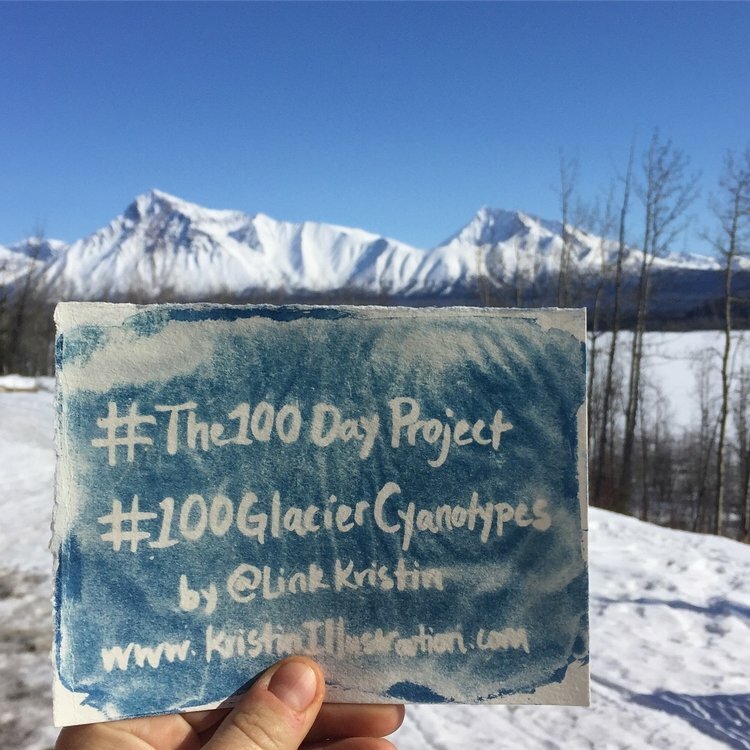 You can learn more about it on their website and see what other people are doing by searching under #the100dayproject. My last post doubted the presence of winter. A week later it has gotten colder. We still just have a light dusting of snow, so you can't ski or really travel much by snowmachine (or at least I wouldn't), but it feels and looks like winter outside. So in contrast I wanted to share some photos from the shortest day of the year and the beauty that it holds. Happy solstice to all and happy winter solstice to those living in the northern hemisphere. About two years ago, I started to work on an illustration project, which became the children’s pop-up book, The Adventures of Apun the Arctic Fox. The book is coming out next week, so I’m excited to share more about my adventures with Apun. Last Monday I sat down at my desk and thought, today is the first day of my new job. I’ve had an exciting fall. After completing my artist residency at Joshua Tree National Park, (which I promise to tell you more about soon! ), I came back to Alaska to scramble like crazy before leaving for another month to raft down the Colorado River through the Grand Canyon. I still remember the first time I saw a Sparrow’s Egg Lady Slipper, Cypripedium passerinum. Allison, who was then the kitchen manager at the Wrangell Mountains Center, pointed one out, and I was delighted that such a cool flower grew in the surroundings forests. Why do I keep a sketchbook? There are many reasons, one of which is that drawing and sketching help me to learn about the world around me. Variation and repetition in nature is interesting to me. The theme has an appealing aesthetic, but more importantly it also leads to interesting questions.